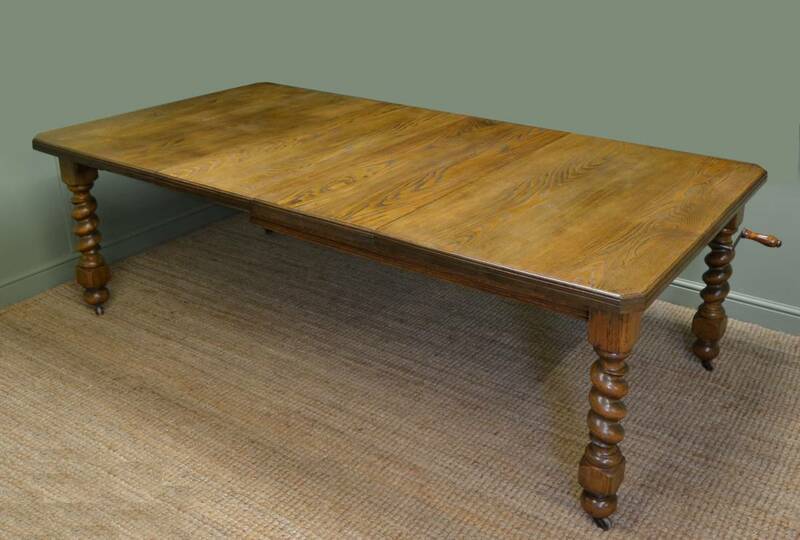 Antique Dining Tables come in many different styles and sizes, dependant on what period they were made in. 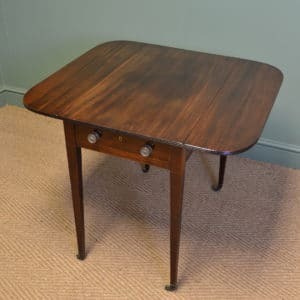 The earliest forms were from the Georgian period in a drop leaf design called the gateleg table. This was made of Oak with two drop leaves that extended to a larger size on a swinging support. The Later Georgian period produced a large dining table in the form of two side console tables, that joined onto a central drop leaf table using brass D clips and this made a very large dining table to seat ten to twelve people. Although these are large pieces, they can be a little awkward as they have lots of legs, making it difficult to get chairs under. 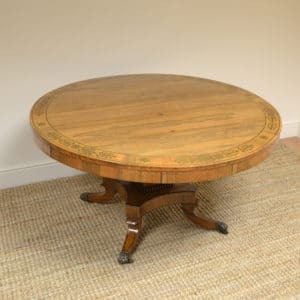 The Victorian dining table did come with ingenuous designs, of a wind out, extending mechanism, enabling you to add several leaves in the centre when you want it larger for occasions when lots of guests arrive for dinner. As these tables only have four turned legs, they are easy to get lots of chairs under, so this makes very comfortable dining. They also stand on castors so it is easy to extend and close. They were mainly built in Oak, Mahogany or walnut as these timbers were readily available. 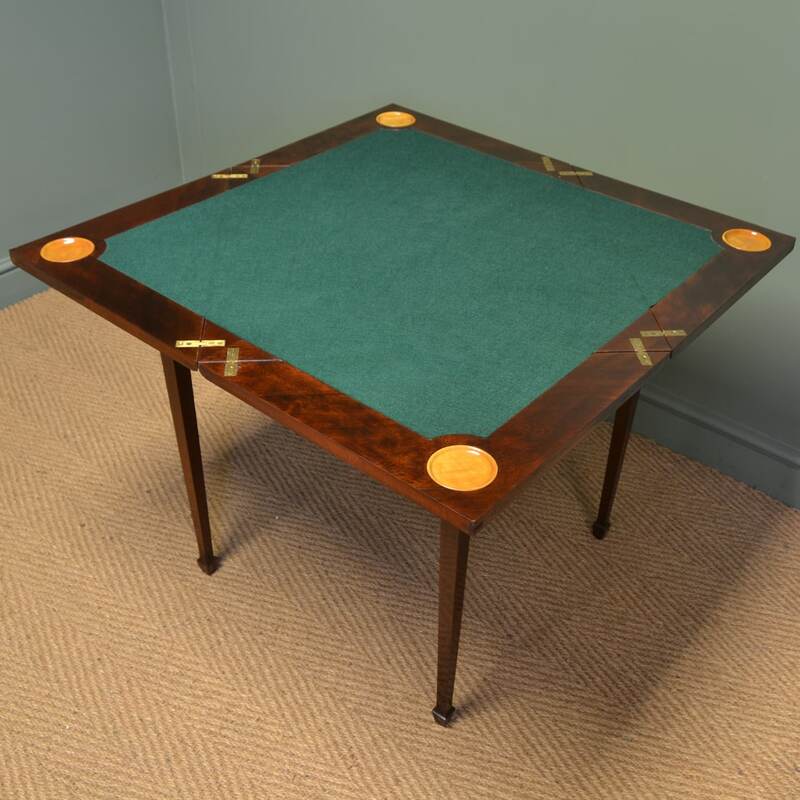 The Edwardian dining table, was very similar to its predecessor, as they still used the extending mechanism, but added more decorative inlay around the edges. They mainly stood on tapering legs with spade feet, but again on castors. 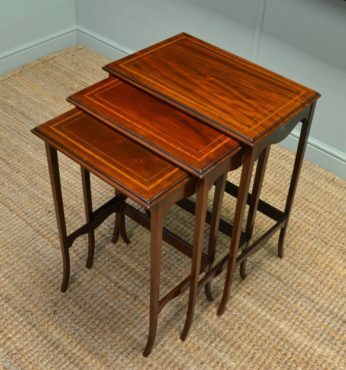 The Edwardian cabinet maker also liked to reproduce older looking designs from the elegant Regency design with out swept legs, to the more rustic Refectory, farmhouse styles in Oak or pine. 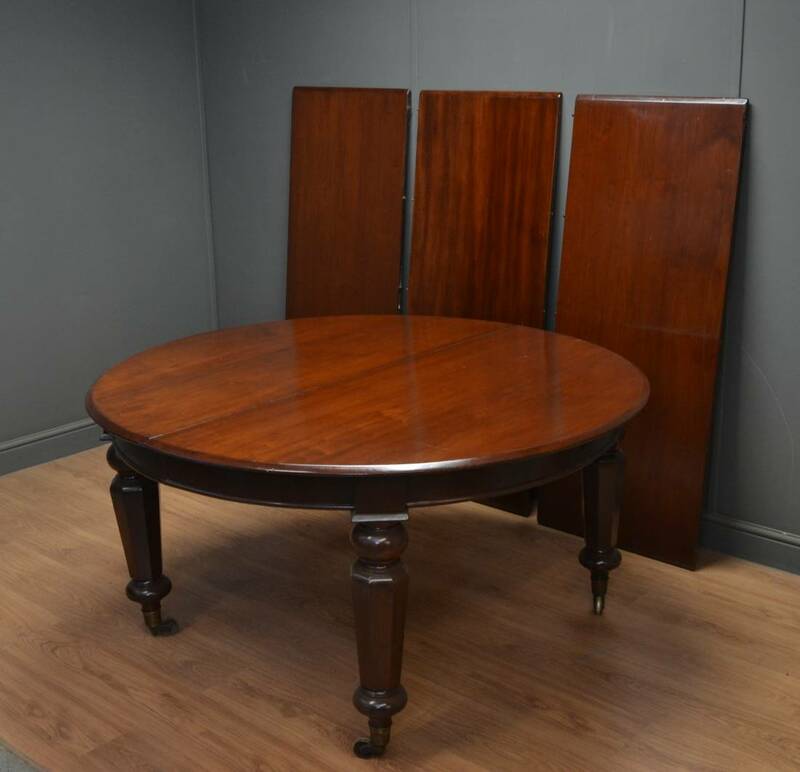 Below are a few examples of previously sold Dining Tables, but if any particular style looks of interest please let us know as we do get many similar designs in stock and we can try to locate something similar. 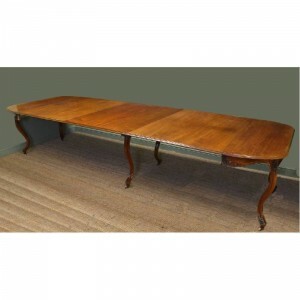 Quality, Early Victorian, Mahogany Antique Extending Dining Table. 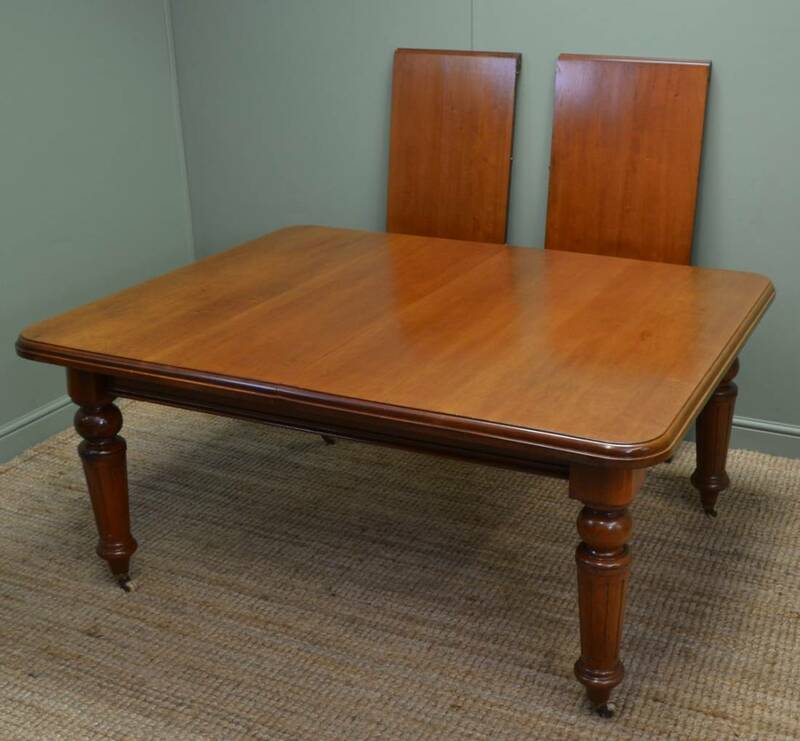 Dating from the early Victorian period, circa 1840, this antique extending dining table is constructed from mahogany. The table is supported by four beautifully turned legs finished with brass cup castors. The top is solid mahogany with a central removable leaf, moulded edges and rounded corners. This lovely dining table is perfect for everyday use or for that special occasion. 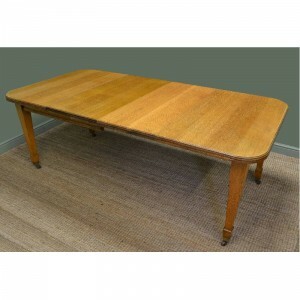 Quality Edwardian Oak Draw Leaf ‘Pineapple’ Antique Dining Table. 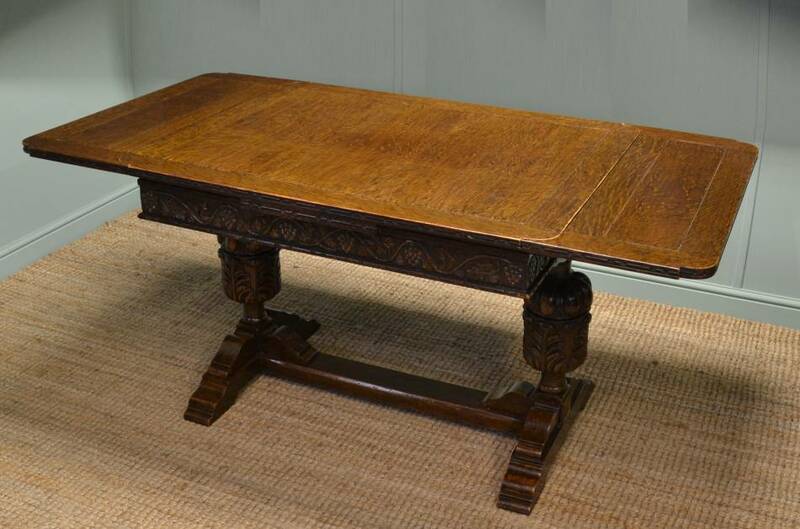 Dating from around 1910 in the Edwardian period this antique dining table is in the Jacobean style and constructed from oak. The top has rounded corners with a draw leaf at each end extending this table from a very comfortable four seater to an all encompassing eight/ten seater for those special occasions. The top sits above a beautifully detailed frieze with vine carvings and stands on two chunky pineapple designed turned pedestals. It has substantial moulded feet and a cross stretcher making it very stable. 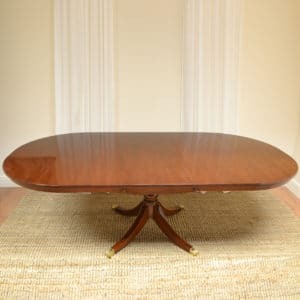 Mellow Mahogany Victorian Antique Extending Dining Table. 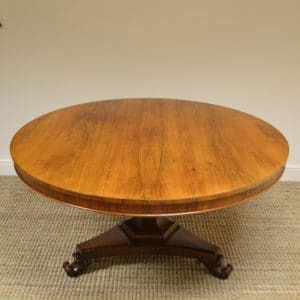 Dating from the Victorian period, circa 1880, this antique extending dining table is a lovely mellow shade of mahogany. It comes complete with winding handle and winding mechanism along with two central removable leaves. 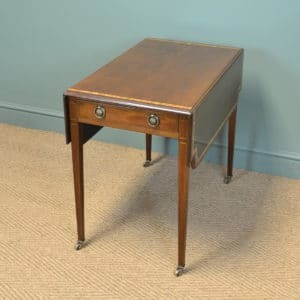 The solid mahogany moulded top stands on four beautifully turned reeded legs with brass castors having white porcelain wheels. 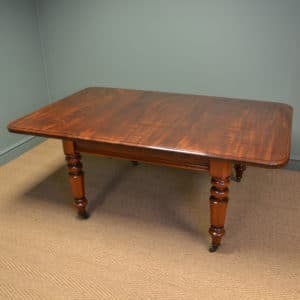 Grand Victorian Mahogany Extending Antique Dining Table. 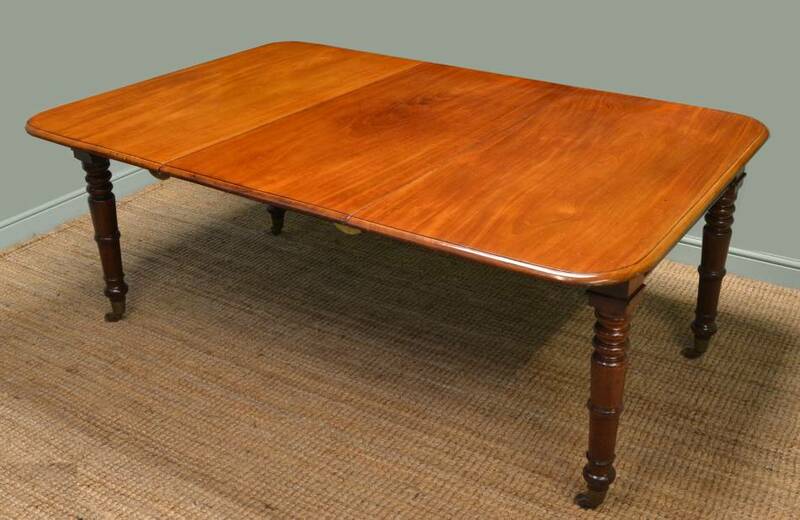 Dating from the Victorian period, circa 1880, this huge antique dining table is made from mahogany. The table extends using a winding mechanism along with winding handle. The solid mahogany top includes three large central removable leaves (one being matched) and has a moulded edge with simple but stylish apron. The table stands on four chunky turned tapering octagonal legs which are finished with brass castors. 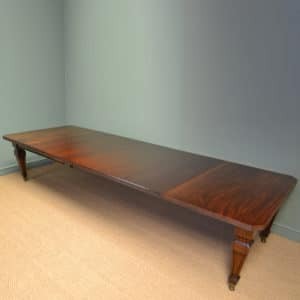 Huge, Victorian Mahogany, Extending Antique Dining Table. 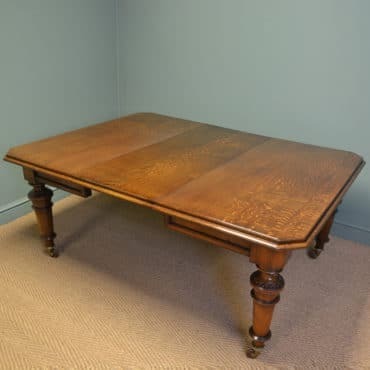 This very impressive antique dining table has grand proportions, dates from the Victorian period, circa 1880, and is constructed from mahogany. The top extends using a wind out mechanism with winding handle. 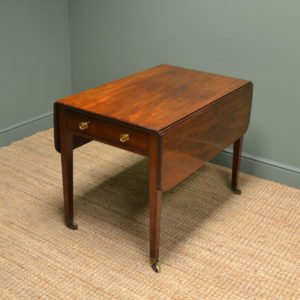 The whole top is solid mahogany and includes four central removable leaves. It sits above a deep apron below which can be found four beautifully turned legs finished with brown porcelain castors. With a maximum length over 11ft this huge dining table offers a realm of opportunities for dining options. When closed it becomes a very practical table for everyday use! 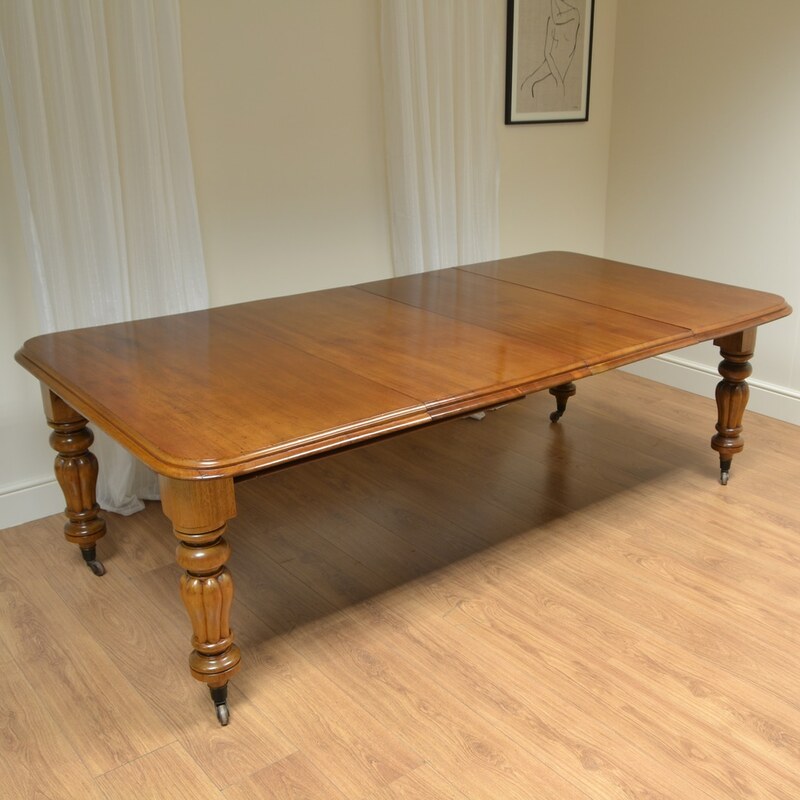 Large Quality Mahogany Antique Victorian Extending Dining Table. This antique Victorian extending dining table, circa 1880, is constructed from quality mahogany and has impressively large proportions. 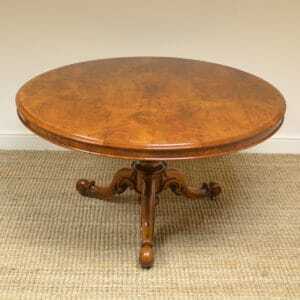 The extending solid mahogany top operates using a winding mechanism with winding handle. It has three central removable leaves (one having a very small old repair) is beautifully figured and finished with a moulded edge. When closed, the table creates a more intimate oval dining experience compared to the grand and impressive setting that the fully extended version generates. A deep apron sits above four beautifully turned reeded legs which are topped with bulbous decorative hips and finished with brown porcelain castors. 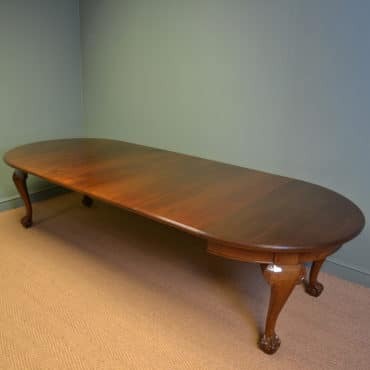 This grand dining table is in very good overall condition and can seat between ten and twelve people. 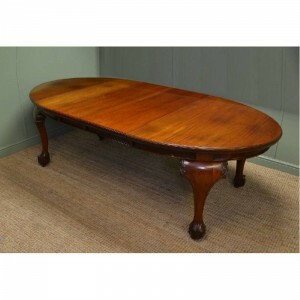 Large Golden Oak Victorian Antique Dining Table. This beautiful antique dining table dates from the Victorian era, circa 1870, has large proportions and is a wonderful shade of golden oak. The solid oak top has a moulded edge with rounded corners and comes complete with two central removable leaves, winding mechanism and winding handle. It stands on four delightfully turned legs finished with brass and brown porcelain castors. 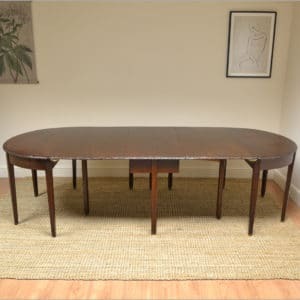 Large Edwardian Ash Antique Wind Out Dining Table. 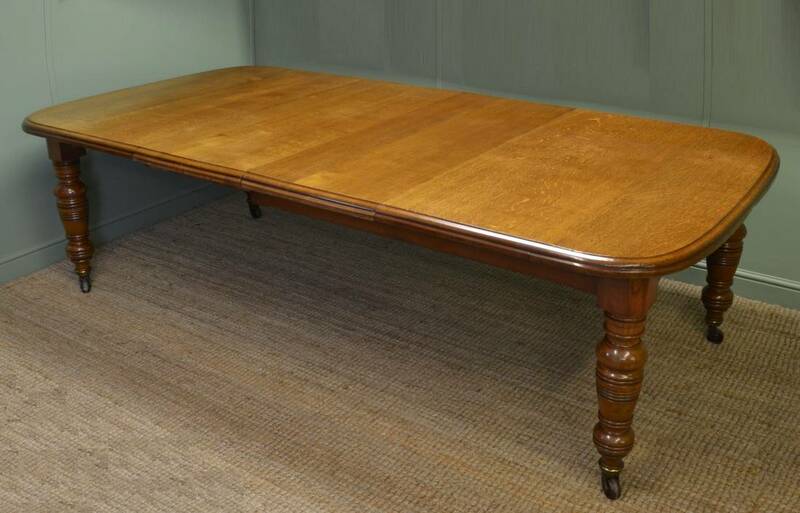 This beautiful antique ash Edwardian dining table, circa 1900, has large but practical proportions. The solid ash top has a moulded edge, canted corners and two central removable leaves. The length of the table is adjusted using the winding mechanism operated by the winding handle (included). It stands on four chunky turned barley twist legs finished with brown porcelain castors and would seat ten people comfortably when fully extended. The table is a lovely light shade of ash, a tone more associated with oak. Antiques World offer Quality Antique Dining Tables for sale with Extending, Farmhouse and wind out designs from the periods of Victorian, Georgian and Edwardian.